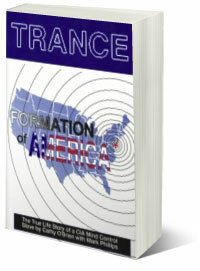 TRANCE Formation of America, was compiled from our testimony for the US Congressional Permanent Select Committees on Intelligence Oversight. TRANCE was released in 1995 when the National Security Act was invoked in court on our case, making dissemination of these proven facts tantamount to our survival. Seeming prophetic upon its release, TRANCE is now in law libraries worldwide due to its exposure of US Government criminal operations that have since come to pass and continue to unfold to this very day. 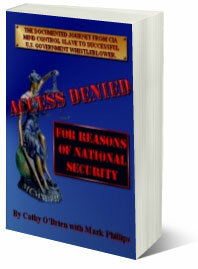 ACCESS DENIED For Reasons Of National Security details our journey of survival to become US Government Whistleblowers, and is a testament to the strength of the human spirit and power of love. ACCESS DENIED reveals the healing methods Mark taught me that people all over report applying to themselves to heal from varying levels of trauma, abuse, PTSD, torture and/or control. Aside from the links shown, you may also order our books from our ebay Store! SECURE OUR BORDERS! BUILD THE WALL! Reality Marketing, Inc. © 1997-2018 All Rights Reserved.